Just over a year ago, Pope Francis boarded a flight at Philadelphia International Airport to return to Rome. He left behind hundreds of thousands of pilgrims who endured transportation woes, security lines and long waits to participate in the liturgy, to hear his words about mercy, love, and service, or just to get a glimpse of their spiritual leader. The passage of time has not diminished the waves of joy and the jolt of spirituality that rained down on the faithful across the Philadelphia Archdiocese. Father Dennis Gill, director of the archdiocesan Office for Divine Worship and rector of the Cathedral Basilica of SS. Peter and Paul, said that the visit by Pope Francis offered the faithful the opportunity to open their hearts to his message and to enable them to live more fully their Christian lives. 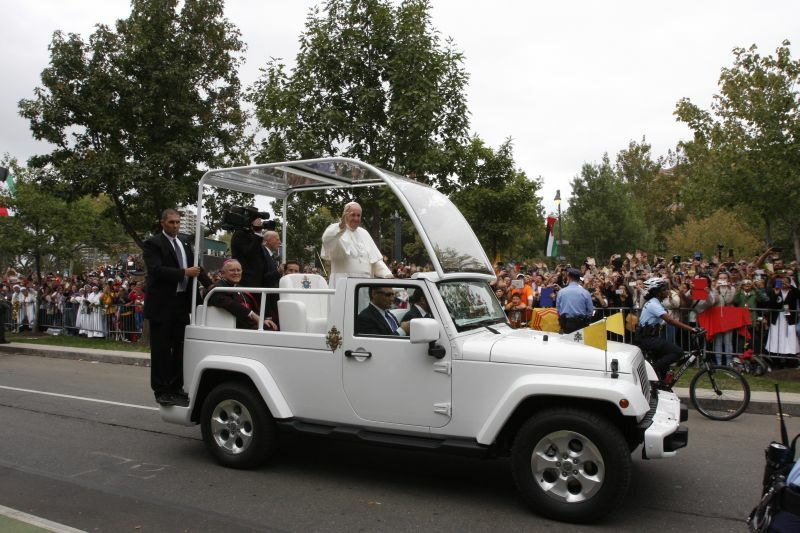 He pointed to the Sunday, Sept. 27, 2015 Mass on the Benjamin Franklin Parkway, memorable for many reasons, most especially because so many people were able to follow the liturgy and the papal remarks to the crowds in attendance and to television viewers. “People in general were able to encounter the Vicar of Christ. I would say that the impact was personal for everyone involved,” Father Gill said. The months of preparation in advance of the visit were tremendously busy, but Father Gill said he was blessed to have the help of an excellent team of people working with him to ensure that everything was in place for the papal visit. “I was most impressed by the Holy Father’s master of ceremonies, Msgr. Guido Marini,” Father Gill said. “He reminded all of us — in his own manner and with his instruction — that although the Holy Father was among us, the celebration of the Eucharist was always about Christ and his loving death for us. “On another personal note, I was deeply affected by the witness of faith on the part of so many of the lay faithful in Christ and his world, especially young families,” Father Gill said. Scott and his wife Jennifer opened their home in New Hope to a young couple from Michigan and a priest from Colombia, South America, who wanted to participate in the World Meeting of Families and maybe to get a glimpse of the pope. The McDonalds originally planned to go to the city on their own and let their guests make their own plans to attend the World Meeting and the papal events. It didn’t work out that way. The three pilgrims came on the Monday before the World Meeting of Families and, as the days passed, they formed a bond that led to all of them attending the congress and the papal events together. The end of the celebrations did not fracture their friendships; they all remain in touch through email and Facebook. “During the week, everything was so well planned,” Scott McDonald said. “The biggest impact for me was the events’ joy among everyone who attended. We saw a group from Kenya who were all dressed alike and they moved together in song and dance. Since last year, I pay more attention to world events (and) to the struggles and joy of peoples around the world,” he said. But the whole experience also confirmed for him that he’s taking the right direction in his journey of faith. McDonald is in his second year of formation for the permanent diaconate program of the archdiocese, and he said the pope’s visit solidified his commitment and reenergized his faith and appreciation for the worldwide Catholic Church. Lisa, her husband Robert and their three children, Meghan, 19; Michael, 15; Kelli Anne, 9; and her mother, Claire Foy, were chosen to carry the offertory gifts up to Pope Francis during his Mass on the Parkway. It was an unforgettable experience for a family who devotes itself to the Catholic Church, working from within their parish. Yizzi teaches in the PREP program, and she and her husband are involved in Christ Renews his Parish, a spiritual renewal movement. “Presenting the gifts was an amazing experience and it was wonderful to feel just how much love he has for his people,” Yizzi said. This was not Yizzi’s first papal Mass. In 1979 she and her family traveled to Philadelphia to attend the outdoor Mass celebrated by Pope John Paul II during his visit to America. Her mother had been in a wheelchair at the time, so it was a special blessing, she said, that her mother could go with the family to participate in the liturgy celebrated by Pope Francis. The family still talks about last year’s papal visit because the weekend reflected the love and sharing among pilgrims from around the world. It was especially meaningful for her when she witnessed the pope stepping away from his route to embrace children, the future of the church. “The whole weekend, at different venues, focused on children and, as a mom, I believe that the Catholic Church needs to focus on children, to bring them to God,” Yizzi said. Even after the pope’s departure, the graces of his presence had unexpected results. A relative of the Yizzis who was a member of the Philadelphia SWAT team guarding the pope told his family that, despite having been on duty for many dignitaries, the papal visit affected him deeply. “When he got home, he told his wife what a wonderful experience it had been, and decided that it was time for the family to return to regular attendance at Mass,” Yizzi said. Sister Phyllis lives at Camilla Hall after an illness forced her retirement from her pastoral ministry at Nazareth Hospital in Northeast Philadelphia. She followed the papal visit closely via television. Unable to walk or stand for long periods of time, Sister Phyllis serves at Camilla Hall as a cantor for Mass, and at funerals. “I had been discouraged and feeling the loss of my ministry for some time. Giving that up and coming to Camilla Hall was not an easy move; I had to work through that. I was praying, but not the way I used to pray. Then the pope came to town and it renewed my prayer life,” Sister Phyllis said. It was Pope Francis’ assurance of God’s love for everyone that re-energized Sister Phyllis’ prayer life and, heeding his call for mercy, she renewed her prayer devotions, especially to the Sacred Heart. “The pope’s message just warmed my heart, reminding us what a gift our faith is. I began to pray again with the devotion I’d had, especially to the Sacred Heart, when I was younger,” she said. Rita added her voice to the celebrations as part of the choir that sang for the papal Masses. As awesome as that experience was, she is still moved by being in the presence of Pope Francis and having the privilege of hearing him urge the congregation in the basilica and the crowds on the Parkway to practice the virtue of mercy and love God the Father. Peg Gould has been working for some time with people in need, especially the homeless. Pope Francis’ visit has renewed her, and her work seems “more like a vacation,” she said. “It means so much more and I understand better what it’s like to be a Catholic today. The pope among us has given a rush to my faith,” Borton said. Another benefit was the impact the visit had on her 25-year-old son, Chris. He grumbled at the prospect of going into the city and navigating the crowds and security stations. But he didn’t want his mother go alone, so he decided to accompany her. Mother and son took a train from Langhorne to center city, walked to the Parkway and stood along the papal route. Maybe his mom would get just a glimpse, he thought. And they did. The papal motorcade zipped by to the cheers of tens of thousands. Pope Francis smiled and waved at the crowd and Chris-the-grumbler “lit up,” his mother said. That flash of light turned his life around, he said. “In that early evening light, the moment became so special. I didn’t expect to feel such awe. What he (later) spoke about affected the way I view the world. What he spoke about touched so many. His words affected the way I see the world. I realized that humanity is not just a moment in time, but life and faith just continues to move forward,” Chris said. Father Ianelli’s pilgrimage to see the pope took him all over the city. Undaunted by the packed crowds, he attended the Masses in the basilica and on the Parkway. He was in the crowd when the pope spoke at Independence Hall. He participated in the World Meeting of Families. And he’s still traveling, this time within boundaries of his sprawling Bucks County parish. “During this Year of Mercy, our focus is reaching out to those disaffected with the Catholic Church. We have been meeting with people in neighborhood settings and, from those meetings, people have come back to church,” Father Ianelli said. The basilica Mass was especially meaningful for Father Ianelli because an icon of the Holy Family belonging to Our Lady of Guadalupe Parish was taken to the basilica to be blessed by the pope. Deacon Brady, his wife Christine, and his son Kevin got to shake Pope Francis’ hand, one gesture among many that deepened the family’s sense of faith and community in their everyday lives. “There is a connection with the pope unlike any other connection,” Deacon Brady said. “I see new people at church and I feel invigorated in my faith and in my ministry. He has a more natural way of communicating with his people and stands as a bridge, a connection between himself and those around him. He seemed a caring and compassionate leader, and set the example of love and mercy for those willing to hear him,” said Brady, who has served the church as a deacon for 26 years. Anne didn’t get to see the pope. A bus trip, a subway ride and a long walk led her group to a five-hour ordeal in a security line. By then, the papal motorcade had gone. But the trip wasn’t in vain. It was the vast crowd of people around her who set the tone for the day. “We stood with people from all over the world. We heard all different languages. There was one person from Syria. We all shared stories, food and water. It was the embodiment of the kind of community the pope was trying to promote,” Kane said. Through that experience, Kane said she came to a better understanding of grace and love, and that all are members of the Body of Christ – led on earth by the pope.